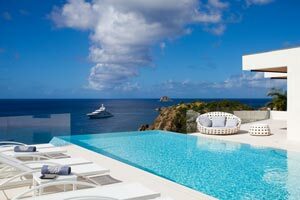 Villa UJV 366, also known as Villa Vitti, a 5-bedroom villa located above Shell beach, is the newest jewel in the crown of St. Barts. It is a glamorous, luxurious home with unsurpassed ocean views. This villas has access directly to Shell Beach via 120 steps for those looking for some exercise. Enjoy the views from the sunny terrace with lounge chairs and water misters that keep you comfortable while enjoying the infinity pool. Just off the terrace is a sleek living room and dining area for evenings spent with friends and family. This high-tech villa is full of amenities guaranteed to make your stay a luxurious one. There is a well-equipped kitchen, which is perfect for your chef to prepare a gourmet meal, while you enjoy the sunset with your guests. Relax at night in your comfortable bedroom with en-suite bath - all decorated in a soothing palette of white and grey. In the morning you will be treated to a beautiful ocean view with islands in the distance and yachts bobbing peacefully at their moorings below. To the rear of the villa is a serene garden, perfect for enjoying a morning coffee or yoga session to start your day. This is the ultimate villa for anyone coming to St Barts to relax, have fun and enjoy the company of their friends and family.